The Forum on the Participation of NGOs in the Ordinary Sessions of the African Commission on Human and Peoples' Rights (African Commission), also known as the ‘NGOs Forum’ is an advocacy platform coordinated by the African Centre for Democracy and Human Rights Studies to promote advocacy, lobbying and networking among and between human rights NGOs, for the promotion and protection of human rights in Africa. The bi-annual event, which precedes the Ordinary Session of the ACHPR, is an advocacy platform for discussing human rights issues in Africa with a view of identifying possible strategies for engagement or redress, which are forwarded to the African Commission as contribution to its work during a said Session. 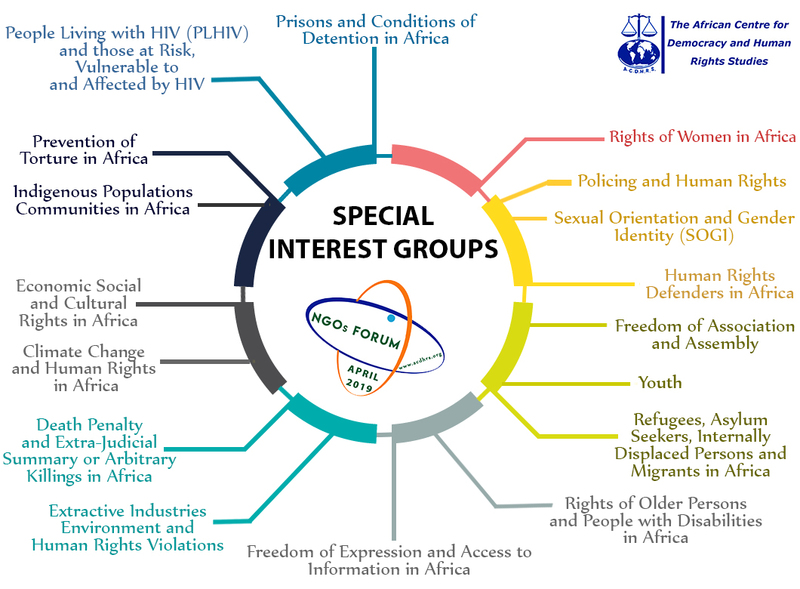 The NGOs Forum shares updates on the human rights situation in Africa by the African and international NGOs community with a view of identifying responses as well as adopting strategies towards improving the human rights situation on the continent. 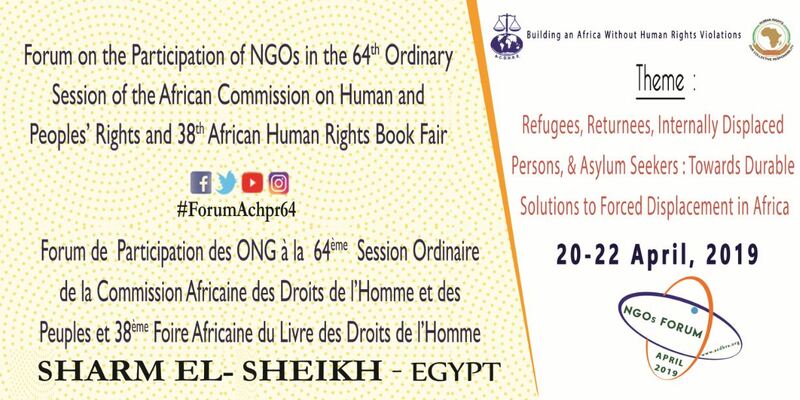 The objective of the NGOs Forum is mainly to foster closer collaboration between and among NGOs and with the African Commission and other African human rights mechanisms, for the purpose of promoting and protecting human rights in Africa. (sharing experiences, best practices and lessons learnt towards durable solutions for forced displacement in Africa) A series of panel discussions on general human rights related issues will be organized within the main agenda of the NGOs Forum as well as at side events, and even extending to the margins of the Ordinary Session. English and French are the languages of the NGOs Forum with available simultaneous interpretation facilities. Representatives from African civil society/NGOs, international NGOs from Africa and beyond working on youth, democracy, human rights and the rule of law issues, academia, media, etc. Participants are encouraged to make the necessary visa arrangements, where required, before departing from their respective countries to Egypt. Where participants do not have Egypt Diplomatic Representation in their countries of residence, the ACDHRS would endeavor to facilitate the issuance of visa on arrival to such participants, provided the ACDHRS is informed well in advance. The African Centre would distribute negotiated room rates to participants. All participants are to pay the registration fee of $150.00 (one hundred and fifty United States Dollars) or its equivalent in Livre Egyptienne, Euros or CFA. The said amount contributes to expenses in relation to the conference package (conference room, tea and coffee breaks, lunch, water, projector, interpretation equipment, Interpreters salary, translation, documentation, stationery and other administrative logistics/support) provided during the Forum . All participants must complete and submit the registration form online no later than Friday, 22nd March, 2019 providing all the details as contained in the registration form. Please note that only duly completed registration forms would be forwarded to the African Commission on Human and Peoples’ Rights, as requested, for onward transmission to the Government of the Arab Republic of Egypt. Therefore, it is important that participants register online before the deadline, as the African Centre would not be obliged to process registration forms received after the deadline. Furthermore, note that the said amount should be paid by ALL participants in cash at the registration desk. Kindly complete the panel request form below no later than Friday, 29th March, 2019. Please note that the African Centre is not obliged to receive and process panel requests received after the deadline. Partners are required to contribute the amount US$300.00 (three hundred US Dollars) for all approved requests as their contribution towards the organization of the NGOs Forum. 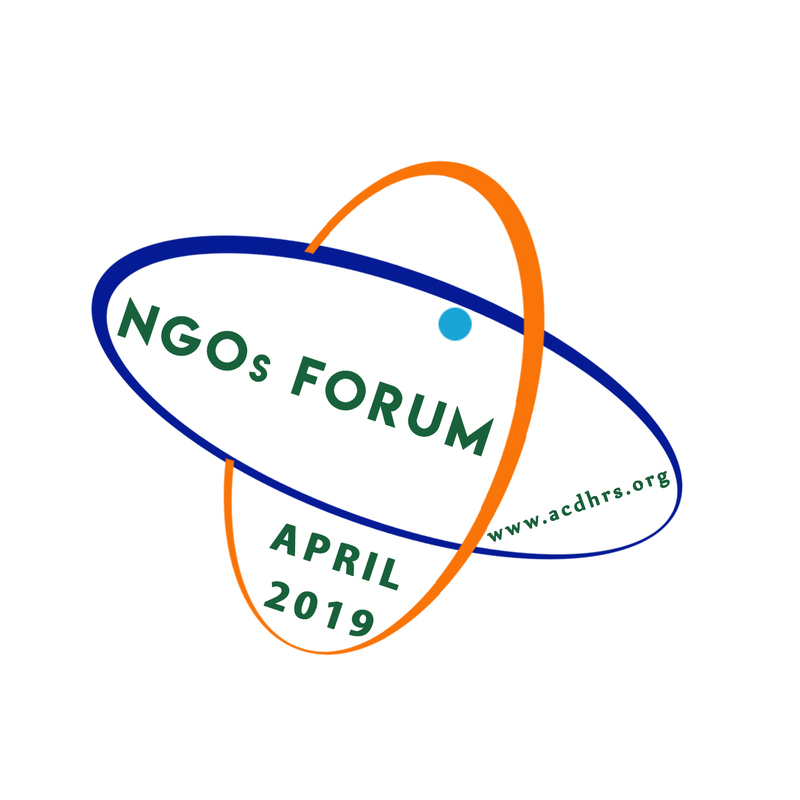 Please note that for panel requests to be considered by the Steering Committee of the NGOs Forum, all request must be framed around the theme of the Forum. Some duties, amongst others that will be undertaken by the African Centre include booking of meeting venue, distribution of invitation letters, registration of participants, booking and confirmation of interpreters (if any), facilitate purchase of stationery (if any), prepare folders, prepare name tags, badges, tying of banner, planning sitting position, distribute documentation, photocopying, etc. However, if the African Centre is informed of the organization of the side event only for its information, then the Partner would not be required to pay the administrative fee. For more information, please send an e-mail to: Mr John GBENAGNON, ACDHRS Communication and Information Officer at communications@acdhrs.org and copy Mr Yankuba Keita, ACDHRS Documentation Assistant at library@acdhrs.org.